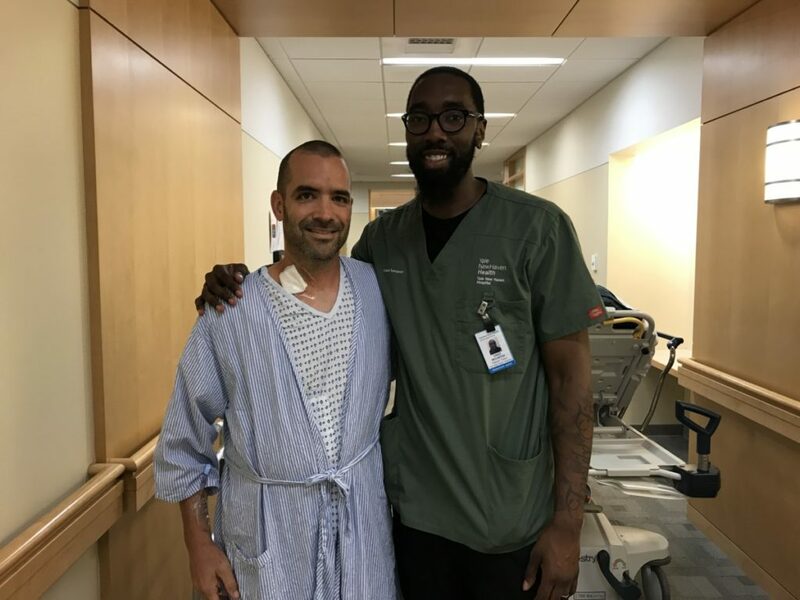 This is the second in a 3-part journal that documents my experience as a living liver donor at Yale New Haven Hospital during the summer of 2017. The first part covers the decision-making process, testing and the time leading up to surgery. 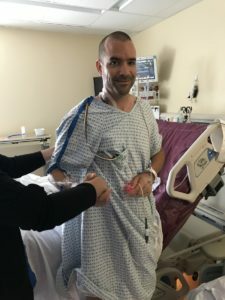 The second part is about my time in the hospital, and the third part covers my recovery and getting back to normal life. 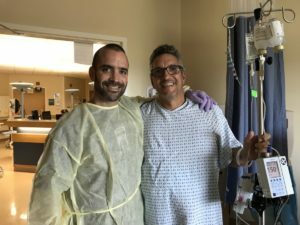 I documented all this to be a resource for other potential donors, to be able to read a first-hand account from someone who went through this process as an altruistic donor. I hope you’ll find this interesting. 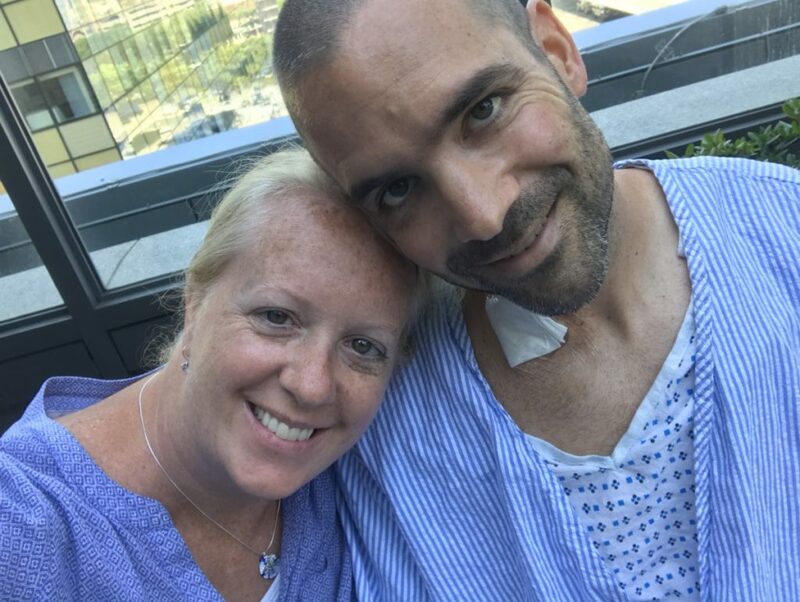 I found being a living liver donor to be an incredibly rewarding undertaking for so many reasons that will hopefully come through in my writing. Sunrise on the way to the hospital. I had a revelation last night. When Melanie and I first moved to Coult Lane in Old Lyme six years ago (unknowingly right down the street from Rob and Lori Wallace), our neighbor across the street was a peculiar man who spoke in a way that can only be described as antiquated, like listening to an old radio broadcast. He was a very tall man and walked with a severe limp. he always had a huge smile on his face when we’d see him and sometimes he left little gifts for Parker in the mailbox. Melanie and I talked about him quite often. He was a clock repairman and in many ways seemed like he came from another time. After we moved to Library Lane, we would still talk about him, wonder about how he was doing or if he ever finished the many projects in his house that he always seemed to be working on. We still occasionally see him driving around town and are happy to know he’s alive and well. One time, we weren’t so sure. It had been weeks since we’d seen any activity at his house and we went up to check on him, peeked in the windows to see if we could see him. Nothing. We drove around trying to find his car. You see, we cared about this man, even though our interactions with him were fairly limited. This neighbor’s name? Rob Glass. It seems in some small way, this was all meant to be. I was told to arrive at the hospital at 8:00am for surgery to start at 9:00am. We got there around 6:45am in the hopes of catching Rob and Lori on their way in – Rob was supposed to arrive at 7:00am for his surgery to start at 8:00am. Melanie and I sat in the main hospital entry for a long time and never saw them! We found out later that they had gone in a different entrance. Oh well, at least we got there in plenty of time to relax. Mom and dad got there early too and sat with us as we waited. I got checked in and then waited, somewhat nervously, until they brought me into a pre-staging room right on time. 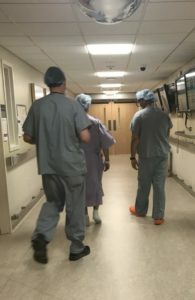 This was the last room I’d be in before being escorted to surgery, and Melanie and I was nervously joking around about everything to try to set Melanie’s mind at ease. This was not an easy moment for her, and I tend to be a goofball when I sense anxiety. I put my gown on and several people came in to start getting me ready. It was freezing cold in the room. I signed a consent form for a nerve block with the anesthesiologist, which is meant to help with the pain from the incision during the time when it is the worst, around the first 36 or so hours. This was described as a bunch of little shots all around where the incision would be made and in hindsight I’m very glad I consented. The anesthesiologist who was responsible for getting my IV started had a hard time finding the vein in the back of my right hand – probably because I’d had nothing to drink all morning. His first attempt didn’t work and he said he’d wait to try again until we were in the surgery room. 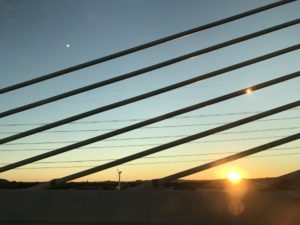 I felt bad for him – it seemed like a stressful situation and it’s probabkly not enjoyable to have to stick someone more than once to find a vein. By this point in this process, I’d been poked with needles enough times that this didn’t really bother me at all. My thoughts were not in any way with my hand. I was thinking about Melanie, Parker, and Rob. Around 9:00am, Melanie and I were beginning to wonder what was going on, as it seemed to be taking too long for me to be taken in to get started. I was also freezing cold, even with a blanket on me. They told us there was a little delay in getting the room ready but that I’d be going in soon. This happened a couple of times until I think I was finally taken in around 9:30am. 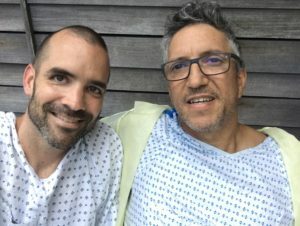 They also advised me multiple times that when I got into the surgery room, there would be a swarm of people working on me and not to stress out about that – it’s totally normal. I recall thinking – whatever you need to do, do it. I had no expectations or worries about the actual procedure in this moment. I remember being brought into the surgery room and thinking how beautiful and clean it all looked. There were big bright lights, cool looking apparatuses, and a team of people who all seemed to be very focused on what they were doing. And there across the room was Dr. Emre looking very focused, serene almost but with a welcoming and peaceful look on his face. My mind was at ease. They had me lay on the surgical table, which was tricky to get up onto with my gown on. The table was very narrow. I laid there amidst the hustle and bustle of surgery preparations. They started peppering me with questions and made sure I was ok with everything. Each person in the room, and it felt like dozens, had very specific tasks they were doing, each was calmly moving about and each had a friendly face when they looked at me. It was beautifully choreographed teamwork. They told me they were positioning my arms and strapping them down just to help keep me in position. I was so very relaxed at this point. Physically and mentally, I was totally prepared and was at peace. I knew that I was in the hands of the experts in the world at what was about to happen and there was no reason at all to worry about anything. Dr. Emre was calm as he greeted me, with a smile on his face. How could I have any fear? The IV went into the back of my left hand as I lay there looking up at the big round light above me. It was a beautiful, shiny fixture. At one point they all stopped doing what they were doing and they stood around me to run through their paperwork, final checks. One person had a checklist she was going through and each member of the team had to confirm their role and what the procedure was about to be. They asked me to confirm that I was there to donate part of my liver and they each confirmed this was a right lobe liver transplant. That checklist process was pretty quick. I have a foggy memory of them telling me that they were about to start the medicine that would make me relax and go to sleep. There was no turning back and no desire to. 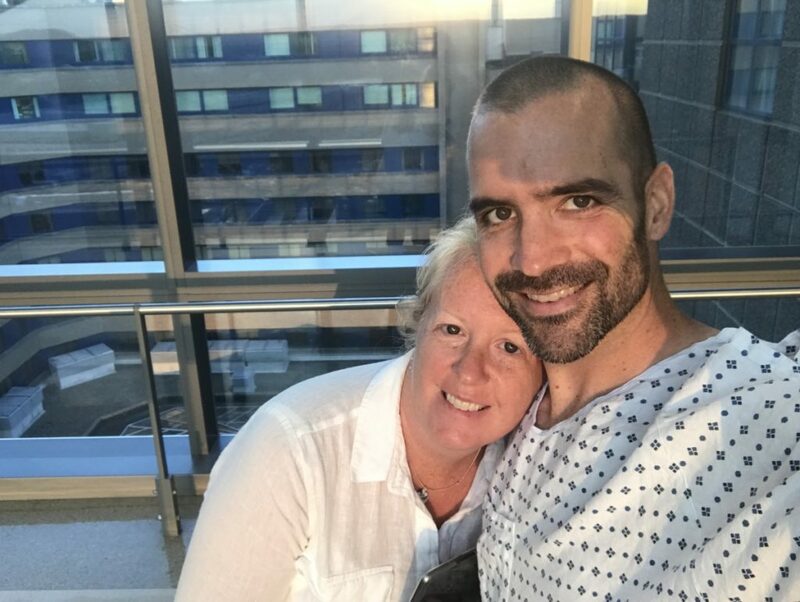 I knew that by the time anything would be happening, I would be totally out of it, and that by the time I would be awake, I would be stitched up and ready for recovery. It’s an incredible feeling to trust your heart completely. It’s an incredible feeling to be at peace with a gigantic decision. I’ll see you all on the other side. I’d gone into all this with the understanding that my surgery would take 4-6 hours, and that I was starting around 9:00-10:00ish. I’d locked 2:00pm-4:00pm deep into my brain as the time I should be finished and in the grogginess of coming out of anesthesia, the only fact in the universe I could understand was that it was later than it should be. 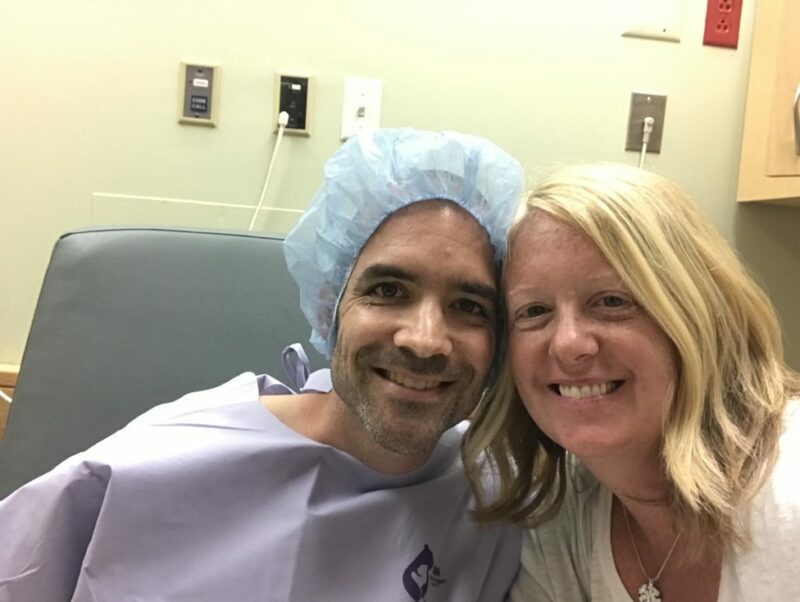 It turns out Rob’s surgery (supposed to be 5-7 hours) took 12.5 hours and mine started a little late because of complications with the beginning of his. 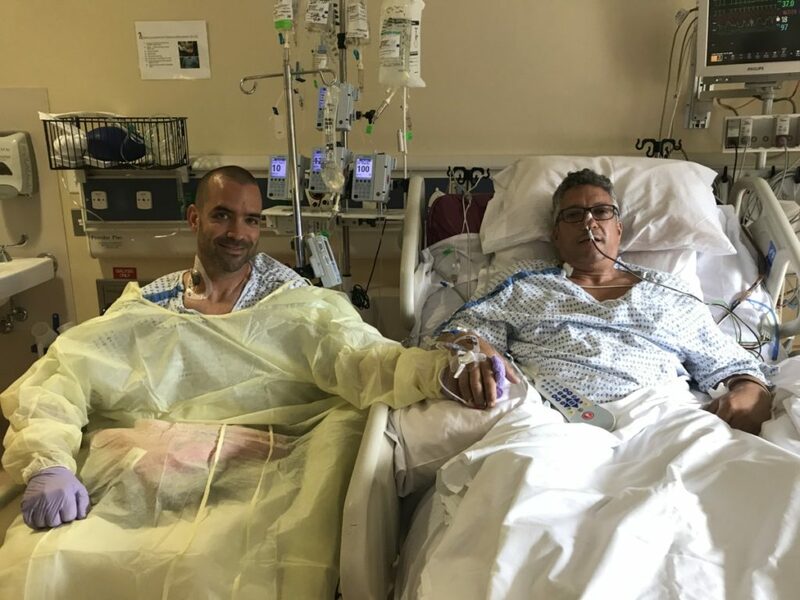 At one point both surgeons were working in Rob’s room. I had a great first ICU nurse named Alex. She was there when I arrived Wednesday and then took care of me the following morning. 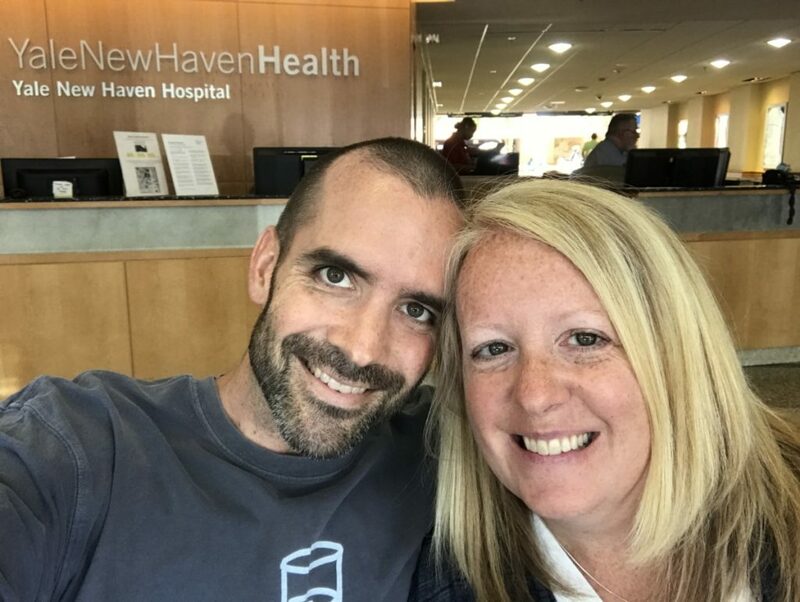 She’s a travelling nurse and I’m lucky she happened to be at Yale New Haven Hospital while I was. She was very sympathetic to my pain, and a very patient caregiver. 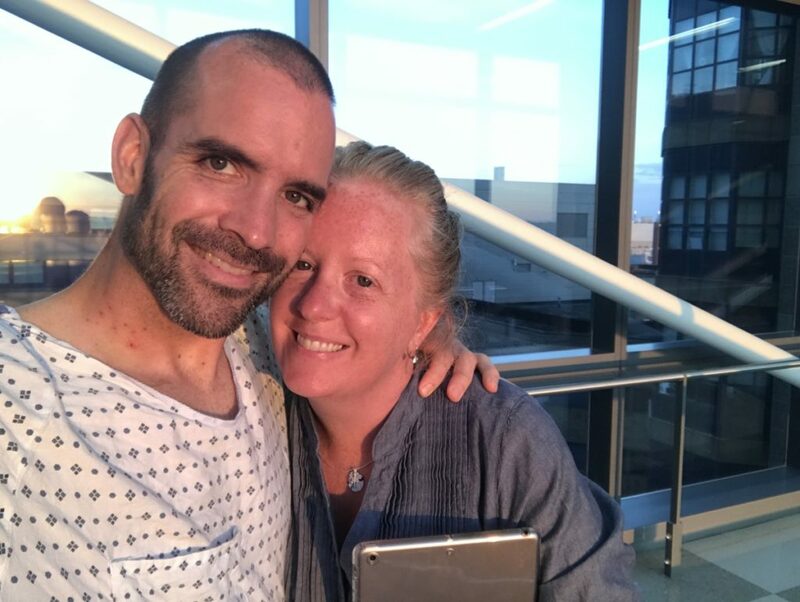 And, according to Melanie she even laughed at whatever ridiculous jokes I was cracking when I first got to the ICU (coming off anesthesia and all…). Supposedly, I was quite the comedian. My first night post-op in the ICU was not at all comfortable. The pain became intolerable, my back hurt (I have a bad lower back and staying in one position in bed for too long causes me a lot of pain) and I couldn’t move. Somewhere around 2:00am I told Melanie she should go home so she’d be there for Parker in the morning when he woke up. Her parents were staying at our house with him but I didn’t want him to be nervous about me and only his mom could prevent that from happening. Melanie (right) was back first thing in the morning, and Janylet (left) brought me a liver-shaped pillow as a gift from the hospital (to be used to hold tightly against my abdomen when coughing). I don’t think I slept 10 minutes that night. One of the worst parts was the nasogastric intubation (tube up my nose and down into my stomach to remove everything from my stomach during surgery). This tube was still in place all night and by morning my throat was killing me from swallowing and having not had any water for over 24 hours. I was parched, my throat was dry and every time I swallowed I felt like a garden hose was lodged in my throat. I begged and begged and begged and begged to have this tube removed. At one point they let me take a tiny sip of water, which was immediately sucked out of my stomach through this very tube but at least the cool water provided a little bit of relief to my throat. The tube came out mid morning the day after surgery and this one of the highlights of my entire stay in the hospital. I was allowed to chew little bits of ice chips for a few hours and then stepped up to small sips of water. 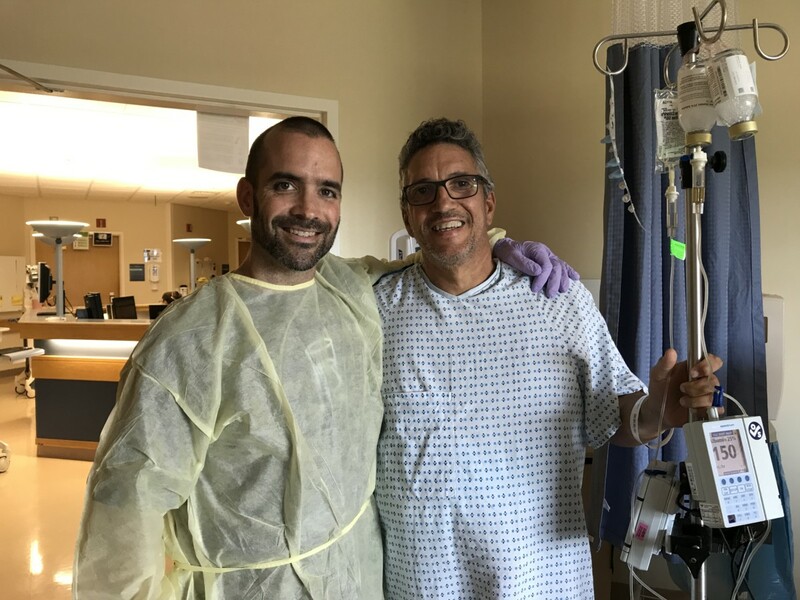 The first time I got up and walked around (with a lot of assistance from Nurse Alex) was Thursday, June 29th at 12:00pm – less than 24 hours after surgery. 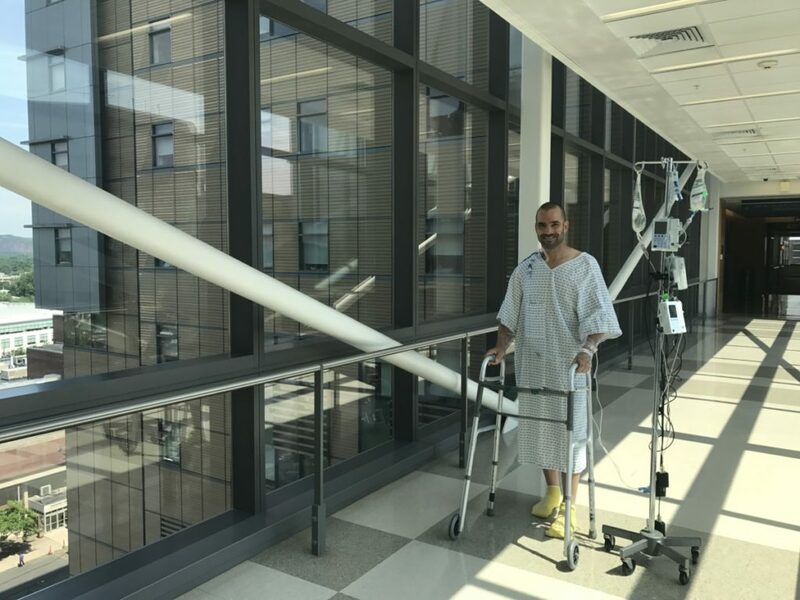 My catheter had been removed (this wasn’t nearly as bad as people had warned me it would be) and I’d been advised by doctors repeatedly leading up to surgery that it would be very important to my recovery to get up and walk as soon as I could. I kind of took that as a personal challenge to push myself as much as I could tolerate. 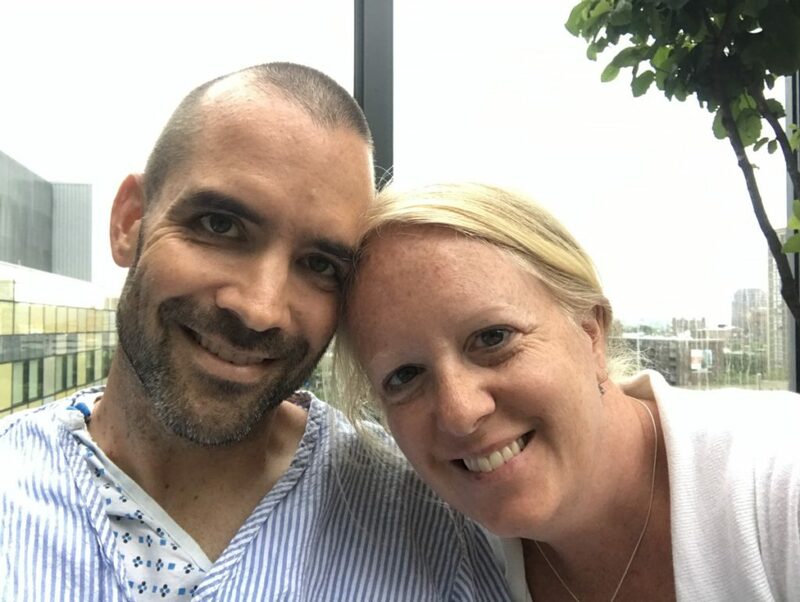 Around 5:00pm (24 hours after surgery), I was loaded into a wheelchair and began my journey to up to West Pavilion 9th Floor room 976 but first we had a very important stop to make. 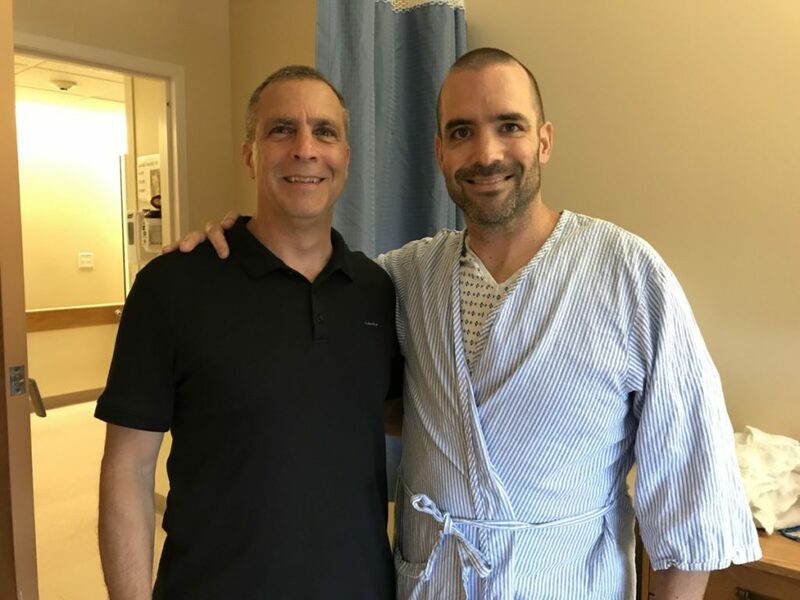 I must have asked how Rob was doing hundreds of times by then, and I was allowed a very brief visit to my new brother, also in the ICU (he’d end up being there for two days). It’s impossible to describe the emotion I felt when I first saw Rob. Neither of us could really move but he reached out and I held his hand in mine. Just seeing him awake was unreal. His fight with cancer was over. 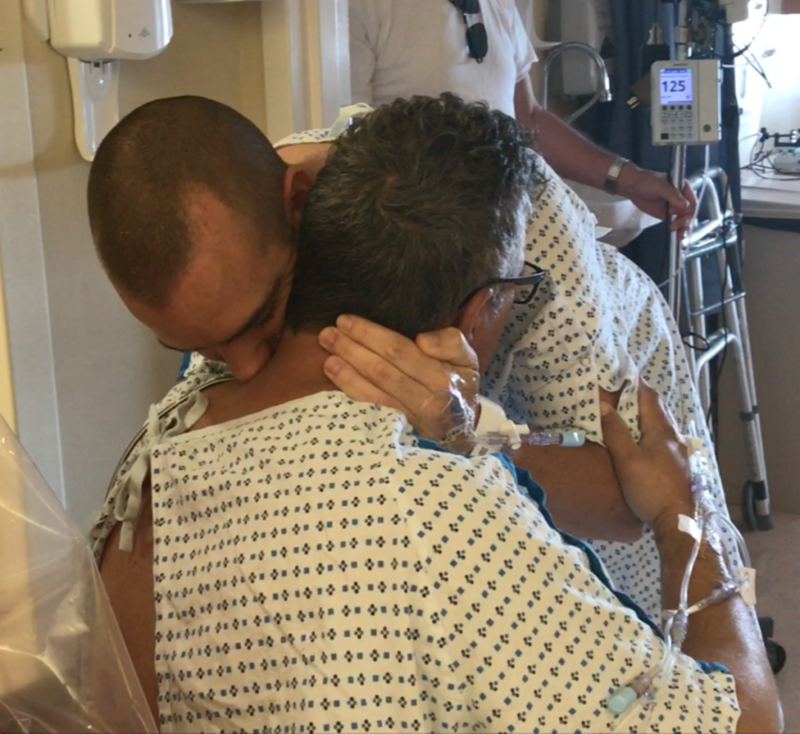 All the pain I’d endured overnight was almost whisked away in these magical moments in the presence of the man whose life, it turns out, I’d saved. It was such an emotional moment and is very hard to describe. I’ve watched the video of this moment so many times since then and every time there are tears in my eyes watching our first conversation with each other. Rob, of course, cracked jokes which destroyed my abdomen as I tried not to laugh and engage these muscles but couldn’t help it. 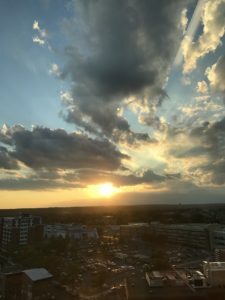 That evening I went for my second (slow, pained, assisted) walk on the 9th floor. At 2:00am I was awoken from a sound sleep to go for an abdominal ultrasound. The transport who wheeled my bed there was a delightful young man named Chazz. I told him why I was in the hospital and showed him the incision. He seemed to be in awe and told me that my story gave him goosebumps. He told me about his kids and I did the same. Such a nice guy and a beacon of light at that moment when I was in pain and so, so, so tired. Later that day he came to check on me but I was sound asleep so he left his cell # on my white board. My first shower felt like a million dollars and was easier than expected because my incision was glued shut on the surface, not stitched so it was totally waterproof. It was nearly impossible to get myself dressed, as any movement in my abdominal area brought searing pain. If I didn’t twist or torque my midsection at all, it was just generally sore. 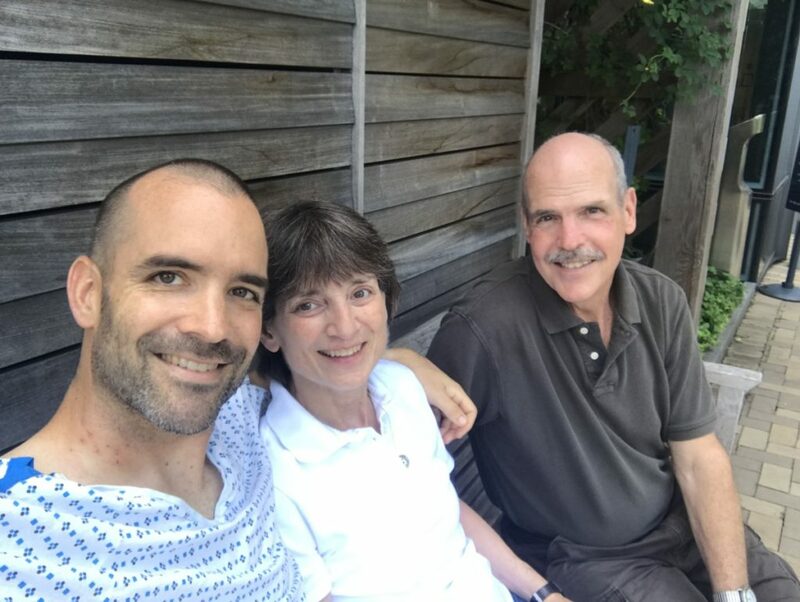 My parents came to visit today and it was so wonderful to see them. They were very relieved and maybe a little surprised to see me up and about, with a smile on my face and it was comforting to be in their presence. 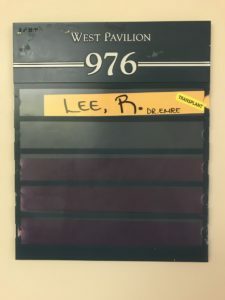 While mom and dad were visiting, Rob was finally moved up to WP9 from the ICU. He stopped by my room on the way to his and we shared an incredibly powerful moment together. 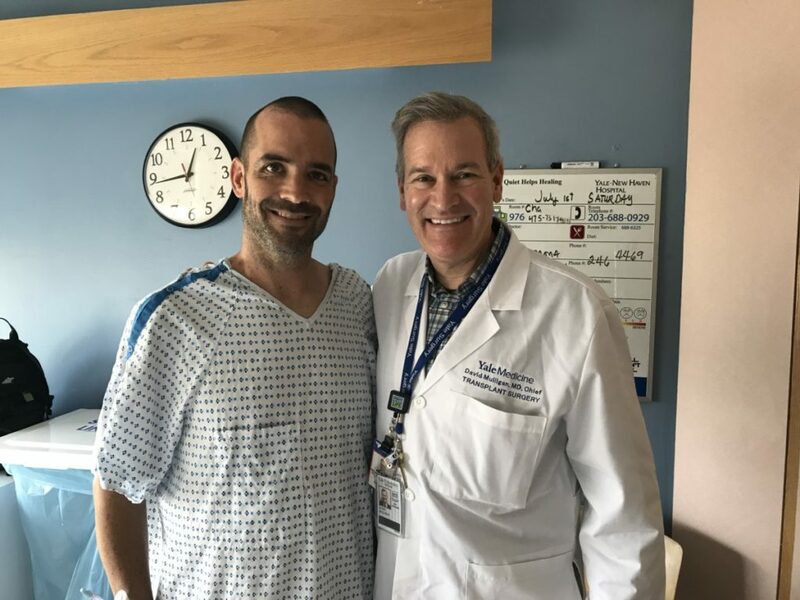 This move out of the ICU was a giant step forward and a reassuring sign that his new liver was being accepted by his body and was beginning to function well enough that he would not require 24-hour monitoring. This was such emotional and exciting news! 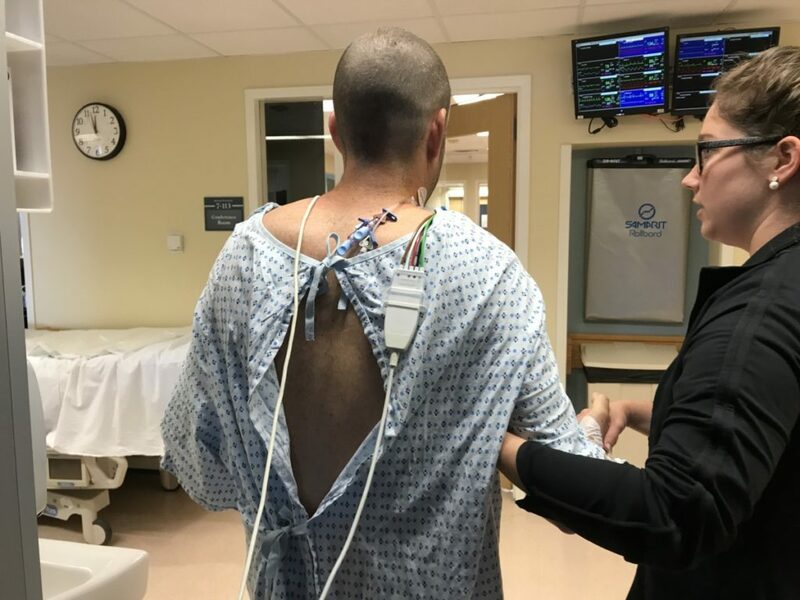 The central line was a little freaky when that came out… Nothing like having a tube removed from your neck, and it went much farther in than I was expecting. It was nice to have that out though but I know the nursing staff appreciated it being there because it was easier to give me IV meds and to do blood tests. 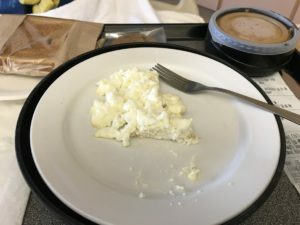 I was VERY happy when I could finally eat some mashed potatoes and toast this evening, 2 days after surgery. I was so sick of the clear stuff – there’s only so much chicken broth you can drink, and almost everything else was grossly sweet – Jello, italian ice, juices, etc. I hadn’t chewed food for four days by the time I could have some mashed potatoes and toast. This evening, while on another walk, Melanie and I randomly bumped into Chazz and we both lit up at seeing each other and I had Melanie take our picture. Over the next few days Chazz and I texted several times. It’s amazing how those little moments in life can potentially spawn a friendship. The first few nights on WP9 I had these inflatable boot things on my feet and calves for sleeping – they stimulate blood flow and help eliminate the possibility of blood clots. They were very comfortable but also tricky to move. I have kind of a bad lower back and it hurts to lay in one position in bed for too long. 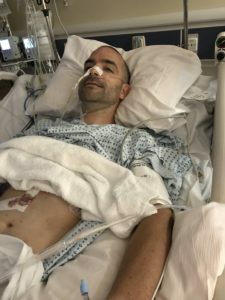 This made my hospital stay the most tricky because I had no abdominal strength to help me roll over in bed, and because of the incision going right through my core muscles, many of these types of movements in bed were extremely painful. Thankfully I had a physical training consultation at one point and learned the mechanics of how to use my elbow to help me sit up in bed from laying down position. This did not alleviate the pain, but did make it possible to sit up from a lying down position. It was not exactly a graceful motion, but it got the job done. 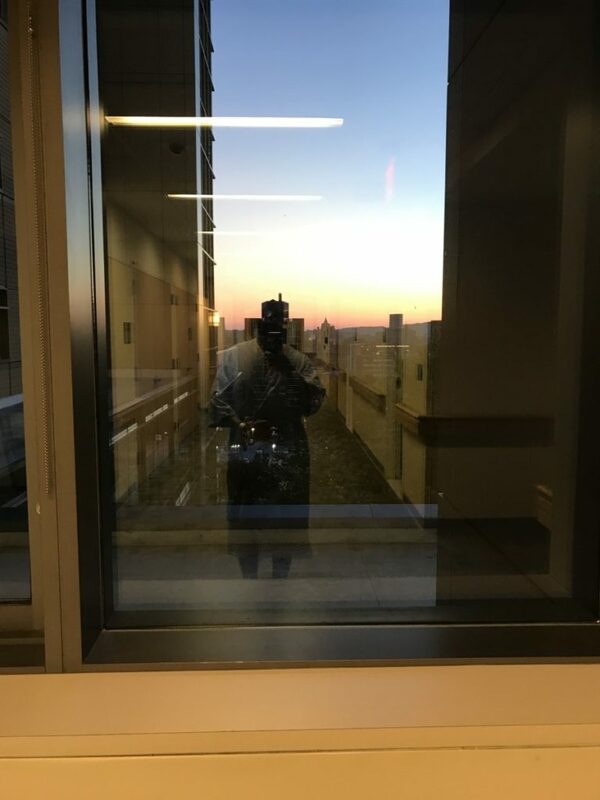 Over the next few days in the hospital, I became known as ‘The Wanderer’ – walking laps and laps around the 9th Floor of West Pavilion, over the bridge to Smilow and back…Repeat. I did the best I could to stay active and I think it helped me start feeling better quicker than expected. I had to have the IV lines replaced a couple times because they go bad after a while, but I definitely got used to having tubes taped all over my wrists – this is where the periodic meds were administered. It was awesome when those came out and I was put on pills rather than IV meds. It was so much easier to deal with moving around in bed then. I sneezed one time. That was one of the worst moments of my entire stay, as it felt like my body was being ripped apart. 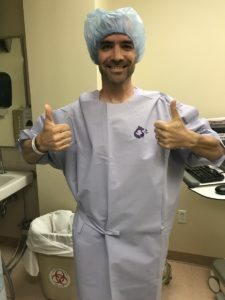 On that note, Dr. Emre had reassured me that the multiple layers of stitches inside me were of such strong material that there was no way possible that I could re-open the incision or in any way damage that area. I didn’t need to worry about rolling over in bed or anything like that. While I trusted Dr. Emre with my life, that sneeze felt like a herd of elephants exploded out of my midsection. I was advised to hold a pillow strongly against my stomach anytime I needed to cough, and this happened a lot. And it hurt, a lot. You don’t realize how much you rely on your ab muscles until you have none, and even a little cough is excruciating. For the first several days, I sounded like a mouse when I could muster up the strength to squeeze out a tiny cough. 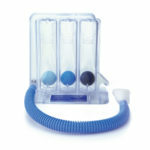 On a related note, I was terrible at the incentive spirometer. If you don’t know what this is, it’s a plastic hand-held apparatus with 3 plastic balls in it that require various amounts of airflow to make them rise to the top. Inhaling deeply through a hose coming off the end of it causes the balls to rise, depending on the strength of the inhale. My strength of inhale was pretty pathetic, and it hurt a lot to practice with this thing. But, it was suggested I try it hourly as a means of fighting off the change of catching pneumonia. I stuck with it but did not enjoy it one bit. 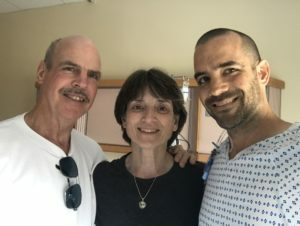 I had wonderful visits from my parents, my brother and sister-in-law Dylan and Sally and their daughter and son, and from George Manguilli, who I mentioned in Part 1 of this story. It was nice to have some regular conversations, talk about my experience so far and to go for a few more walks with my family. If I haven’t said it enough, the healing garden is really a wonderful place for patients at Yale New Haven Hospital. This was my first potential date to go home. 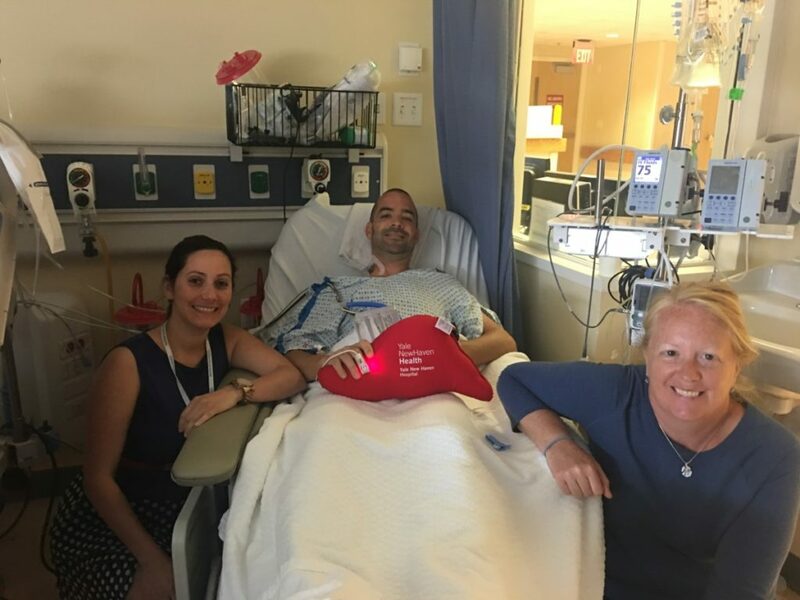 I’d heard of other donors going home on day 5 and the way I was feeling, it seemed possible to go home early. Then, frankly, constipation set in this evening. I don’t think I slept 5 minutes that night. I wandered the halls trying to find some comfort. I didn’t want to go back in my room because both the chair and the bed were too painful to recline in. This set me back a couple days and adjustments to meds helped. It’s pretty comical how commonplace it becomes to discuss various forms of intestinal activity with nurses and doctors. All part of the healing process heh heh. I’ve been remiss talking enough about how important Melanie’s visits were during my stay in the hospital. She was there any chance she could get, and every time she walked into my room it was like a ray of sunlight. We sat together, watched American Pickers together, ordered hospital food and dined in style, she helped me put my socks on, she went for countless laps around the halls with me, we played games on my iPad and spent a lot of time together. She thought about bringing Parker to visit me but I was keenly aware of how nervous he would be to see me in the hospital so we never pushed the issue. He was having a great time with his grandparents, we talked on the phone a few times and I sent him some videos just so he’d know i was thinking about him. It was hard for me to be apart from him for so long, and I really missed him a lot. I was beginning to feel more mobile and was definitely moving around the halls a little faster than in previous days. Still walking pretty slowly but feeling less constricted. Rob was allowed to go outside to the healing garden at Smilow today so Melanie and I went with him. We had a nice little walk together and Melanie and Lori shares some laughs in the fresh air. It was refreshing to all be together outside. The biggest news of the day? I’d be going home the next day! Today, I went home from the hospital. A different kind of independence day! It was pretty weird to put on regular clothes and get all my stuff together. Melanie and I went for a final quick visit to Rob, who would end up being in there for a few more days. Such a surreal moment to start heading for the door, down the elevator and to the car. 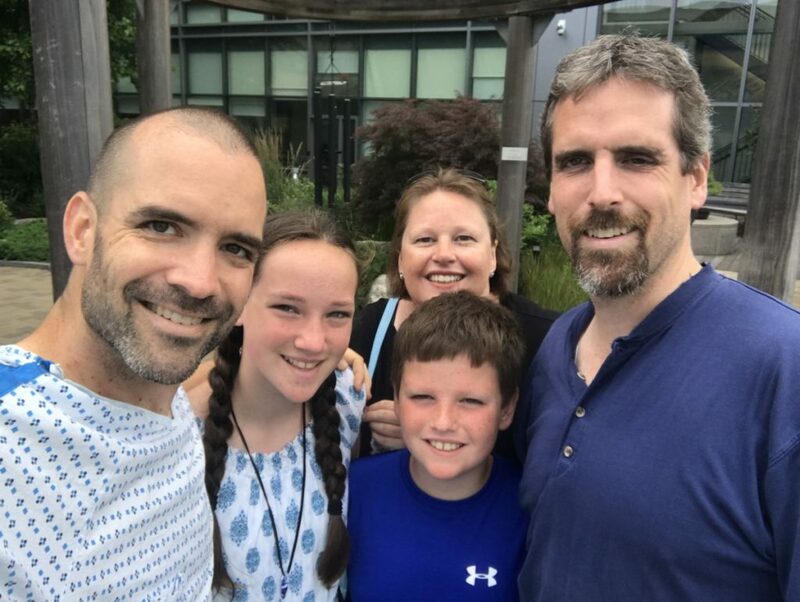 I had shoes on for the first time in 6 days, and had to figure out how to get into the car with as little motion as possible… And then it was time to head back home and see my son! 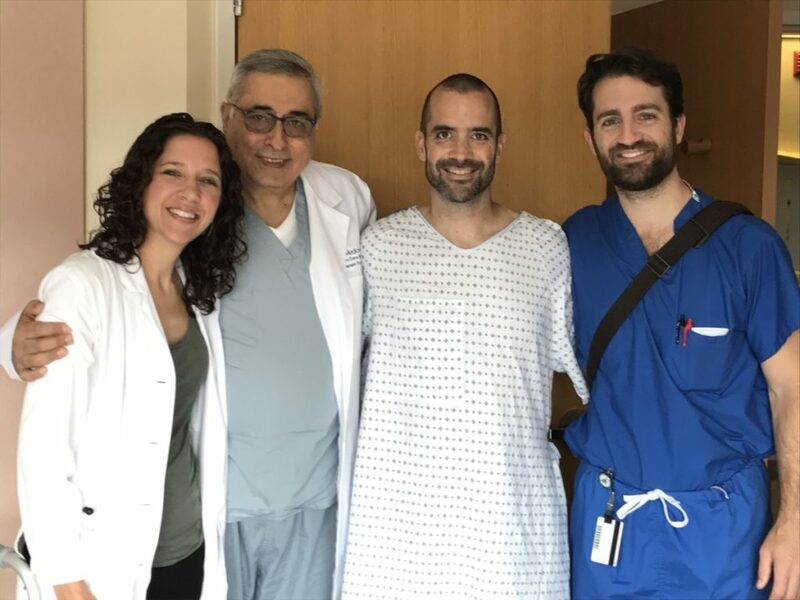 The surgical team rounded daily and always arrived with smiles on their faces. Doctors Mulligan, Emre, Liapakis, Klemen, and so many more, They shared reports of my blood work, asked me how I was feeling and made adjustments to my medication schedule. Since the liver has to deal with pain medicines, and I was left with 37% of my original liver volume, nothing could be administered in very large doses. Instead, they tried to attack the pain with a strict regimen of low doses of various medicines. I happen to be someone who has no interest in pain medicine and at one point tried to be a hero and asked my nurses to cut down on various aspects of my schedule. This was a really bad idea and the next day I asked the surgical team to ignore my dumb ideas and put me back on the schedule they felt was best for me. It was too soon for scaling back any of those regimens. They were also doing daily evaluations of several different blood tests to check my liver function. There was no more imaging while I was in there–they could tell everything they needed to from these various tests. All indications were that my liver was beginning to heal. I think I was only on one medication for my liver. Apparently it heals up on its own! All in all my experience in the hospital was incredible. So many wonderful people took care of me on WP9. Nurses Agnes, Jen, Cindy, Mona and all the PCA’s were awesome. My favorite was Anthony, a young man attending nursing school at Boston College. He had absolutely terrific bedside manner. I went into this with no expectations. I’d never had surgery before and only really had the information the doctors gave me ahead of time to go on. Living through it made it quite real, but throughout I never once even fathomed the idea of regret. Thanks for your posting of your experience. I have been in the initial process of doing this myself and was thinking of doing a video to help people who may go through this see what may happen to them. Happy to help, Jeff! It became a lot of fun to write in my journal and take the photos. 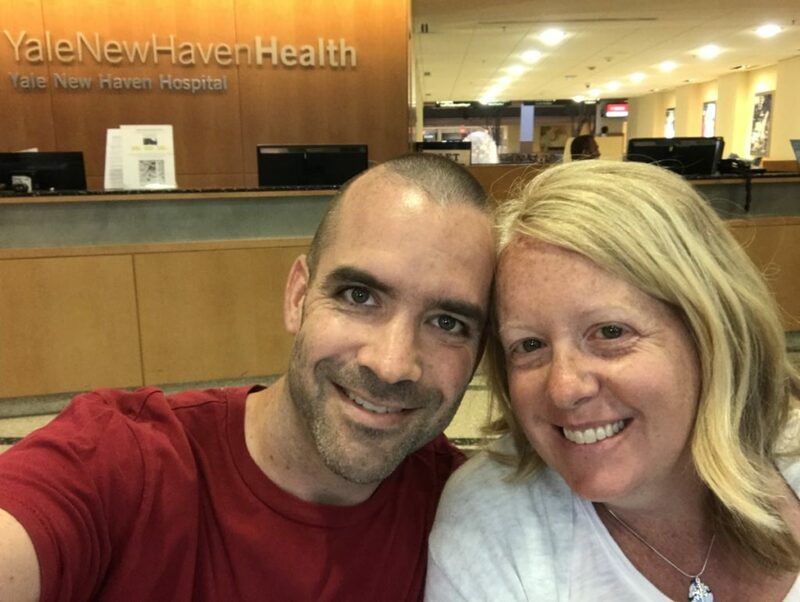 It’s a once-in-a-lifetime experience and I wanted to document as many details as I could for myself, my family, and as a resource to other potential donors. I love the video idea and have a friend whose daughter created one when he donated to his brother. These projects are so personal yet can be very inspiring! Best of luck on your journey!